My painting “Pinioned” is continuing on its international journey, included in this exhibition opening this Saturday. International Surrealism Now presents a strong force for freedom of creativity, love and hope. 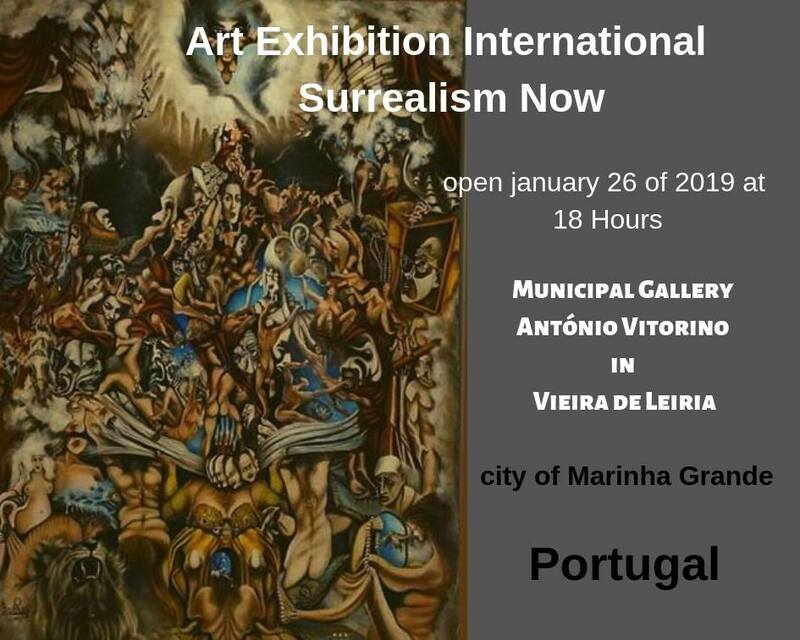 This can be seen in the works of the personal visions of 116 of the world’s leading surrealism artists representing the hopes, dreams and ideologies of 49 countries proposing new perspectives, solutions and healing journeys. Showcasing the dreams of creative and ideological freedom bringing you the vital works of these astounding 21st century surrealist artists. Achraf Baznani, Morocco / Agim Meta, Spain / Aissa Mammasse, Algeria / Alessio Serpetti, Italy / Alvaro Mejias, Venezuela / Ana Neamu,Romania / Ana Pilar Morales,Spain / Andrew Baines, Australia / Aquilino Ferreira, Portugal / Asier Guerrero Rico (Dio), Spain / Brigid Marlin,UK / Bien Banez, Philippines / Can Emed, Turkey / Carlos Sablón, Cuba / Cătălin Precup, Romania / Cristian Townsend, Australia / Conor Walton, Ireland / Cynthia Tom, China / USA / Dag Samsund, Denmark / Daila Lupo, Italy / Dan Neamu, Romania / Daniel Chiriac, Romania / Daniel Hanequand, France / Canada / Daniele Gori, Italy / Delphine Cencig, France / Dean Fleming, USA / Domen Lo, Slovenia / Edgar Invoker, Russia / Efrat Cybulkiewicz, Venezuela / Egill Eibsen, Iceland / Erik Heyninck, Belgium / Ettore Aldo Del Vigo, Italy / Farhad Jafari, Iran / France Garrido, USA / Francisco Urbano, Portugal / Genesis Cabrera, USA / Graça Bordalo Pinheiro, Portugal / Graszka Paulska, Poland / Gromyko Semper, Philippines / Gyuri Lohmuller, Romania / Hector Pineda, Mexico / Hector Toro, Colombia / Henrietta Kozica, Sweden / Hugues Gillet, France / Isabel Meyrelles, Portugal / Iwasaki Nagi, Japan / James Skelton, UK / Jay Garfinkle, USA / Jay Paul Vonkoffler, American / Argentine / Jimah St, Nigeria / Joanna Budzyńska-Sycz, Poland / João Duarte, Portugal / Keith Wigdor, USA / Leo Wijnhoven, Netherlands / Leo Plaw,Germany / Liba WS, France / Lubomír Štícha, Republic Czech / Ludgero Rolo, Portugal / Lv Shang, China / Maarten Vet, Netherlands / Maciej Hoffman, Poland / Magi Calhoun, USA / Marnie Pitts, UK / Maria Aristova, Russia / Mario Devcic, Croatia / Martina Hoffman, Germany / Mathias Böhm, Germany / Mehriban Efendi, Azerbaijan / Naiker Roman, Cuba / Spain / Nazareno Stanislau, Brazil / Nikolina Petolas, Croatia / Octavian Florescu, Canada / Ofelia Hutul, Romania / Oleg Korolev, Russia / Olesya Novik, Russia / Olga Spiegel, USA / Otto Rapp, Austria / Paula Rosa,Portugal / Paulo Cunha, Canada / Pedro Diaz Cartes, Chile / Penny Golledge, UK / Peter MC LANE, France / Philippe Pelletier, France / Roch Fautch, USA / Rodica Miller, USA/ Ruben Cukier, Argentine / Israeli / Rudolf Boelee, New Zealand / Russbelt Guerra, Peru / Sabina Nore,Austria / Sampo Kaikkonen, Finland / Santiago Ribeiro, Portugal / Sarah Zambiasi, Australia / Serge Sunne, Latvia / Sergey Tyukanov, Russia / Shahla Rosa, USA / Shoji Tanaka, Japan / Shan Zhulan, China / Shia Weltenmenge, Germany / Sio Shisio, Indonesia / Slavko Krunic, Serbia / Sônia Menna Barreto, Brazil / Steve Smith, USA / Stuart Griggs, UK / Svetlana Kislyachenko, Ukraine / Svetlana Ratova, Russia / Tatomir Pitariu, USA / Tersanszki Cornelia, Romania / Ton Haring, Netherlands / Victor Lages, Portugal / Vu Huyen Thuong, Vietnam / Yamal Din,Morocco / Spain / Yuliya Patotskaya, Belarus / Yuri Tsvetaev, Russia / Zoltan Ducsai, Hungary / Zoran Velimanovic, Serbia. 49 countries: Algeria, Argentina, Australia, Austria, Azerbaijan, Belarus, Belgium, Brazil, Canada, Chile, China, Colombia, Croatia, Czech Republic, Cuba, Denmark, Finland, France, Germany, Hungary, Iceland, Indonesia, Iran, Ireland, Israel, Italy, Japan, Latvia, Mexico, Morocco, Netherlands, New Zealand, Nigeria, Peru, Philippines, Poland, Portugal, Romania, Russia, Serbia, Slovenia, Spain, Sweden, Turkey, United Kingdom, United States, Ukraine, Venezuela, Vietnam.